Frederic Truby King (1858-1938) was an exceptional man. His library, the Truby King Collection, which has been at Otago since 1989, reflects his wide-ranging and extensive interests and philosophies. Consisting of about 1000 volumes, the library is top-heavy in topics of health, especially those concerning women and children. However, Truby King, founder of the Plunket Society (1907), also owned volumes about gardening, animal husbandry, race theory and eugenics, to name but a few. This notebook is the first ‘Plunket book’. In it, Truby, or Bella his wife, recorded detailed descriptions of babies they visited in the Dunedin, Karitane, and Seacliff areas. This entry reminds us that Truby King was also the director of the Seacliff Lunatic Asylum from 1889 to about 1921. 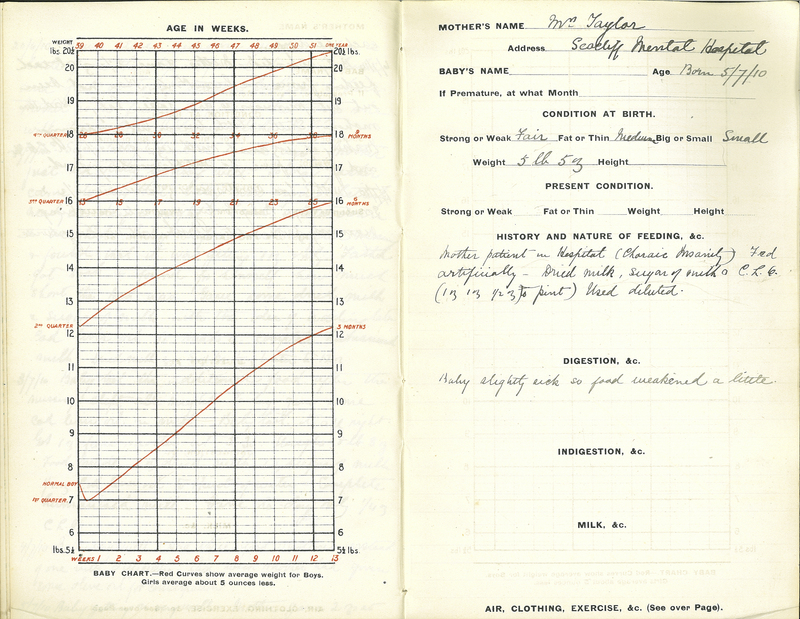 Frederic Truby King, “‘Baby Records from Seacliff’,” ourheritage.ac.nz | OUR Heritage, accessed April 20, 2019, http://ourheritage.ac.nz/items/show/11211.